Meeting Place: “Float Trip Parking Lot” west bank of the Snake River near the Visitor Center at Moose Village. 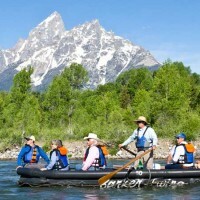 The original 10-mile Snake River Scenic Float Trips operates wholly within Grand Teton National Park. 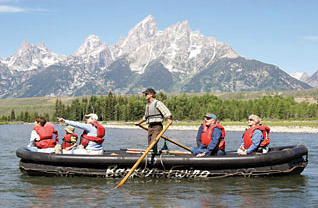 Float beneath the Grand Teton in an area untouched by human development for generations, surrounded by nature and wildlife. 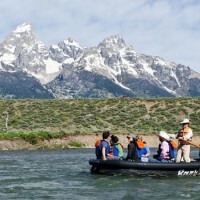 Offering a high level of safety and customer satisfaction, Barker-Ewing’s experienced river guides offer extensive information on Grand Teton National Park and Jackson Hole geology, park history and wildlife habitat. This protected section of the Snake River flows swiftly in places and otherwise meanders peacefully through many side channels, affording guests a unique river experience. 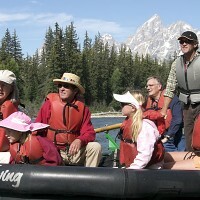 Custom-made rafts are designed to keep passengers dry and comfortable.